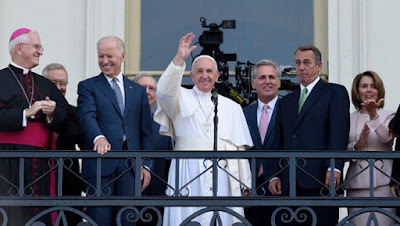 Whispers in the Loggia: In A Polarized Age, A Prize for Partnership – Biden, Boehner Share US Church's "Golden Rose"
In A Polarized Age, A Prize for Partnership – Biden, Boehner Share US Church's "Golden Rose"
Amid an election cycle that one leading US prelate has seen as birthing "an evil spirit among us" – and its upending of modern political convention showing no end in sight – this year's edition of Stateside Catholicism's oldest and most venerable award hearkens back to old times, and in more ways than one at that. Keeping its 134-year tradition on this Fourth Sunday of Lent, last night the University of Notre Dame announced that "to remind ourselves what lives dedicated to genuine public service in politics look like," the 2016 Laetare Medal would be given jointly to Vice President Joe Biden and former House Speaker John Boehner at the Indiana school's 171st commencement on 15 May. Citing the rise of "a toxic political environment where poisonous invective and partisan gamesmanship pass for political leadership," Notre Dame's president, Holy Cross Fr John Jenkins, explained that "while both [recipients] have been loyal and committed partisans" on their respective sides of the aisle, "they were leaders who put the good of the nation ahead of partisan victory, seeking through respectful dialogue honorable compromise and progress. "In recognizing both men," Jenkins stressed that "Notre Dame is not endorsing the policy positions of either, but celebrating two lives dedicated to keeping our democratic institutions working for the common good through dialogue focused on the issues and responsible compromise." First given in 1883, the Laetare honors the exemplary lifetime witness of an American Catholic; over the years, its recipients have ranged from prelates to poets and the nation's lone president from among the faithful. Thanks to its awarding on Lent's "Rose Sunday," the prize's prestige has historically been compared to the ancient "Golden Rose" given by Popes over the last eight centuries to Catholic queens and – far more frequently in recent times – Marian shrines. Of course, the Golden Dome's top accolade comes to both men in the twilight of their respective careers. 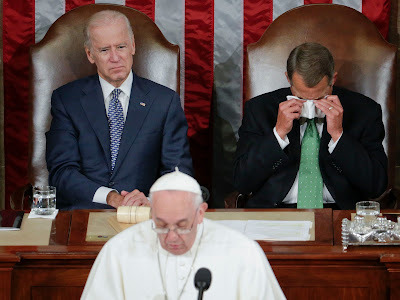 After years of friction in managing the divided wings of his Republican caucus, Boehner jolted Washington by announcing his resignation from the Speaker's chair and from the Ohio House seat he held for a quarter-century just one day after realizing his long-held dream of hosting the Pope for a landmark address to a joint meeting of Congress during Francis' September visit to the East Coast. For Biden's part, having shelved his own long-held presidential ambitions in the wake of intra-party resistance and last year's death of his eldest son, Beau, after a battle with brain cancer, January's inauguration will see the 47th vice-president – the lone Catholic ever to hold the post – out of elective office for the first time since his 1972 election to the Senate, which came even before he reached the constitutional age of eligibility for the upper chamber. As the issues go, even as the announcement has unsurprisingly stoked pockets of grousing from conservatives in light of Biden's stance favoring legal abortion, the joint Laetare is unlikely to bring an encore of the firestorm of criticism Notre Dame took from scores of American bishops over the university's 2009 decision to name President Obama as its commencement speaker and the recipient of an honorary doctorate. Among other contrasts between the two moments, while the university's home-prelate, Bishop John D'Arcy of Fort Wayne-South Bend, famously boycotted the commencement featuring Obama (choosing instead to lead a prayer vigil for the unborn elsewhere on campus), this year's medal picks will share the graduation stage with Cardinal Donald Wuerl of Washington, who'll be receiving an honorary degree of his own. A key ally of both Benedict XVI and Francis alike – and soon to be the US church's lone member of the Congregation for Bishops (a contingent that, not long ago, numbered five) – the DC cardinal's concerted preference for a public engagement rooted in seeking "common ground" over "scorched earth" has been the cornerstone of his 30 years as a bishop both within and beyond the church's confines. Yet even well outside the capital, facing the altered state of an anger-ridden polity likely to produce a Democratic nominee for the Presidency who advocates the full range of "reproductive freedom" as a "fundamental human right" against a Republican contender whose most prominent policy plank has been explicitly blasted by no less than the Pope as "not Christian," a quiet but significant rethinking has already been afoot in many quarters on how the church's concerns in the nation's public square are most effectively addressed. Accordingly, the intrigue won't entirely be off-scene – as the commencement unfolds, Biden's presence will be flanked by two entities involved in ongoing, high-profile litigation against the administration he represents: Notre Dame and Wuerl himself, both having invested significant energy and resources into cases seeking to overturn the contraceptive mandate for religiously affiliated nonprofits, which was inserted by executive regulation into Obama's health-care reform. While the Fighting Irish lost their suit at a second turn in Federal appeals court last year, the case of Roman Catholic Archbishop of Washington v. [Health and Human Services Secretary Sylvia] Burwell is one of seven slated to be heard by the Supreme Court later this month, with the decision expected at the end of the court's term in late June. Given the overlap of suits against the mandate from groups across the Christian spectrum, the court has consolidated the filings into one argument, with the combined case now bearing the name of Wuerl's protege and successor as bishop of Pittsburgh, David Zubik, as lead plaintiff. Keeping with the strangeness of the moment, even the usual "last word" on American law might not end up as such. 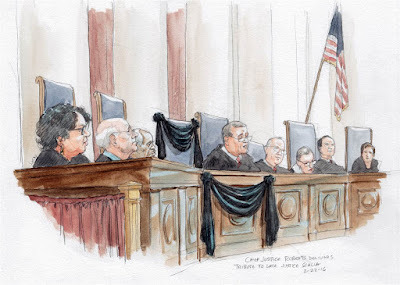 With the court now comprising eight members in the wake of last month's sudden death of Justice Antonin Scalia, a 4-4 tie on the case would simply affirm the contradicting rulings of the appeals courts, creating a national patchwork of forcing compliance with or granting relief from the mandate dependent on the decision of the respective circuit with jurisdiction in the area. Should that most chaotic of outcomes occur, after being restored to its full compliment, a nine-justice SCOTUS may opt for the case to be re-argued and decided afresh to set a binding national standard. In any event, as some bishops have raised the specter of either shutting down or curtailing their dioceses' educational or charitable ministries should the church's benefit plans be required to provide coverage for contraceptives, another supreme authority has already ruled against any attempt toward that end. Almost at the outset of his September speech to the Stateside bench – given for added effect in the capital's cathedral, fresh from a stop at the White House – the Pope saw fit to underscore that, even if the church's "works are often carried out without appreciation or support [and] often with heroic sacrifice," they're nonetheless rendered "out of obedience to a divine mandate which we may not disobey." Given its added connotation of final judgment, the word-choice was no accident.